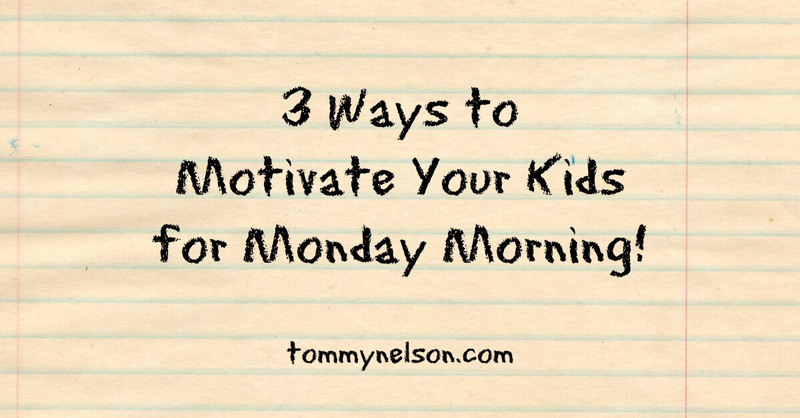 3 Ways to Motivate Your Kids for Monday Morning! The older our kids get, the harder it is to get them up and moving in the morning. Our three-year-old will still often bound out of bed, all smiles, well before any of us are ready to wake up. The nine and seven-year-old? Not so much. The alarm goes off, I go in to make sure they’re getting up, open the curtains…and sometimes they don’t move an inch. I know there are other moms with me in this experience. “Special breakfast” can mean a wide variety of things and is different for each family. For my kids, pancakes or muffins on a Monday morning would be a special treat. These guys get pretty excited about food, so knowing they have something extra yummy waiting for them for breakfast actually gets them moving pretty well! Your children might like cereal, so save a special kind just for Monday mornings. I have one kiddo who loves eggs, so this would be a treat for him. Find a family favorite that you can make ahead of time or without much effort to bless your family to start the week! Can I recommend these chocolate chip scones that are our back-to-school tradition? The boys ask for them for every special occasion! To read the rest of the #MotivationMonday ideas, head over to Home with the Boys! This entry was posted in Blog by Erin Mohring. Bookmark the permalink.